"Don't Tread on Me" Camp Dining Utensil Tool | BUDK.com - Knives & Swords At The Lowest Prices! If your mother came along on one of your camping excursions, she'd likely chide, "Roughing it in the woods is no excuse to forget your table manners!" Thankfully, it's easy to keep Mama happy with this handy camp tool. It includes all the utensils you'll ever need for dining in the great outdoors, yet it fits comfortably in jeans pockets. Mama's right - eating with filthy hands while camping can lead to fun-ruining and even life-threatening illness via the spread of bacteria and other pathogens. 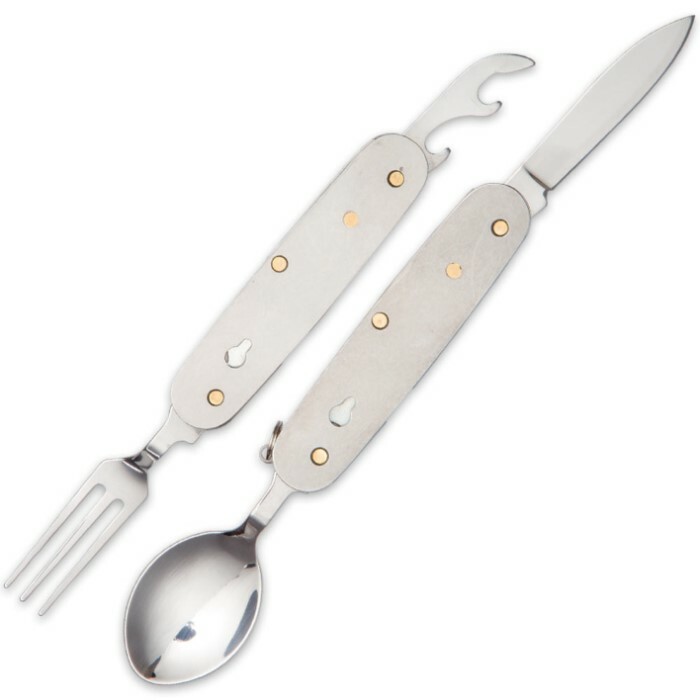 Using the stainless steel fork, spoon, can opener and 2 1/2" knife in this versatile tool may prevent these types of food-borne ailments, all while making camp dining easier and more enjoyable. 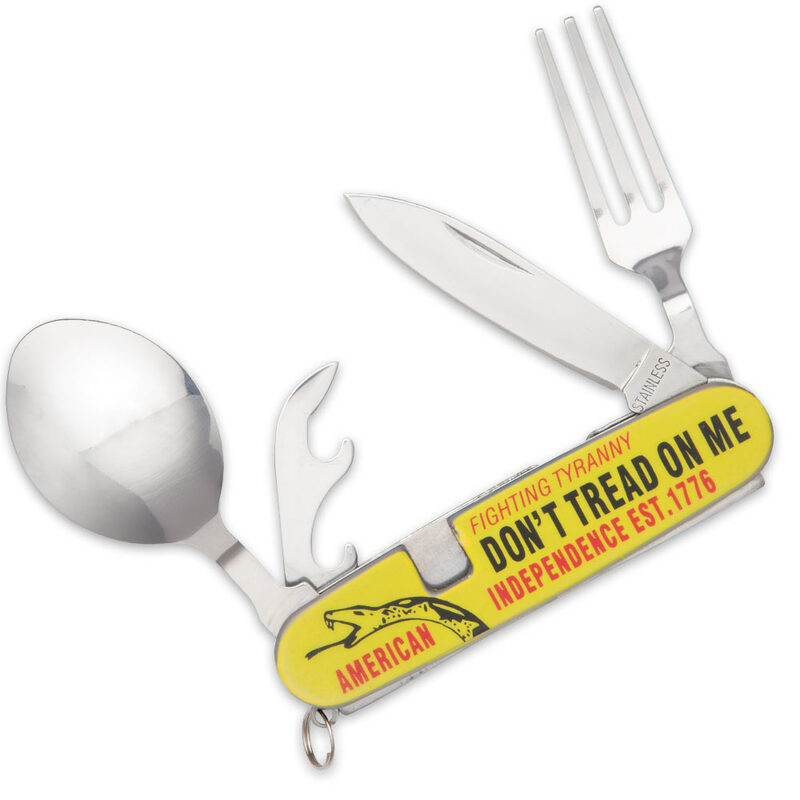 Each corrosion-resistant utensil easily folds in and out like an ordinary pocket knife. Best of all, at just 3 1/2" closed this compact camp tool barely takes up any of the precious limited space in your gear. 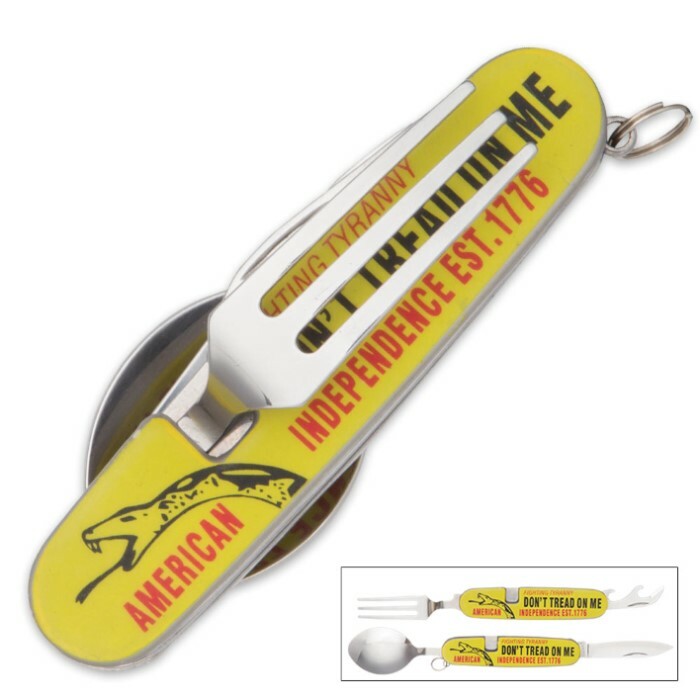 The brilliantly colored "Don't Tread on Me" handle is rubber coated for a no-slip grip, and the handy lanyard ring lets you keep this crucial camp tool securely tethered to your pack or body at all times. With its impressive range of uses and razor sharp blade, this is no mere camping luxury. It's a must-have tool for any serious camper!